Why not pair a black bomber jacket with IRO black leather leggings? As well as very practical, these two pieces look nice paired together. On the shoe front, go for something on the smarter end of the spectrum and finish off this look with black leather ankle boots. For a casual outfit, consider teaming a white knit oversized sweater with IRO Slim Fit Leggings from farfetch.com — these pieces play perfectly well together. For a more sophisticated touch, why not introduce a pair of black leather ankle boots to the equation? Go for a pared down but cool and relaxed choice by pairing a charcoal oversized sweater and IRO Slim Fit Leggings from farfetch.com. Complement your ensemble with a pair of black suede heeled sandals to avoid looking too casual. Opt for a black sweater dress and IRO Slim Fit Leggings for an absolutely chic outfit that's also easy to wear. Introduce a pair of brown leopard suede ballerina shoes to the equation and the whole outfit will come together perfectly. 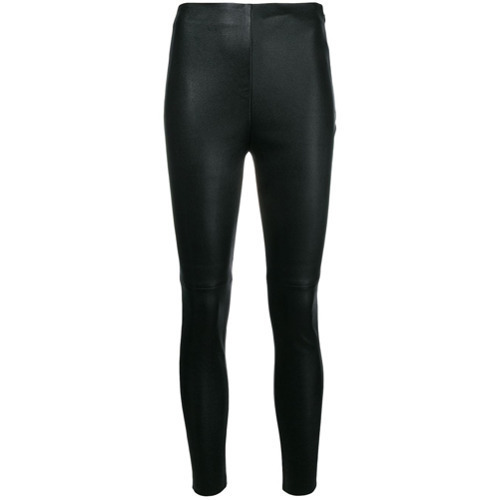 Reach for a black coat and IRO Slim Fit Leggings from farfetch.com to pull together an interesting and modern-looking casual outfit. A pair of black low top sneakers completes this ensemble quite well. If you’re a jeans-and-a-tee kind of dresser, you'll like the pared down but also incredibly chic pairing of a white and black horizontal striped open cardigan and IRO black leather leggings. Navy low top sneakers are a great idea to finish off your outfit. A grey wool biker jacket and black leather leggings are a perfect combo to wear a variation of on off-duty days. For a sleeker twist, why not introduce a pair of silver cutout leather pumps to your outfit? The go-to for cool relaxed casual style? A white and black check coat with black leather leggings. Finishing with a pair of black cutout leather ankle boots is an effortless way to introduce some extra depth to your outfit. Go for a pared down yet casually edgy choice pairing a black blazer and IRO Slim Fit Leggings. Tone down the casualness of this outfit by wearing black embellished leather pumps.